Former EHF referee and delegate from Switzerland dies following serious illness. The EHF has the sad duty to report the passing away of Roland Bürgi on 22 January 2016. 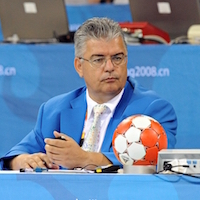 A highly respected official on the international handball stage, Bürgi was member of the International Handball Federation’s Playing Rules and Referees Commission (PRC) at the time of his death. He had a long and successful career both in international handball as well in his native Swizerland. One of the leading rule and refereeing experts in handball, Bürgi served as an IHF and EHF referee for seven seasons from 1993/94 to 1999/00, was a match delegate for 15 years and was a referee lecturer. Bürgi also participated as an official at numerous World and European Championships and Olympic Games. A moment of silence was held in is memory by referees and delegates as news of his passing reached officials at EHF EURO 2016 in Poland. The EHF would like to pass the deepest condolances of the European handball family to Roland Bürgi’s family, friends and colleagues at this difficult time. The funeral service will take place on Thursday, 28 January at 14:00 hrs in Wald, Switzerland.